I firmly believe everyone should have an on-going goals list, dreams list, bucket list or whatever you desire to call it. It’s a place that you can create a vision for your life with everything want to accomplish right in front of you. It’s a simple idea but being able to continuously focus on your goals and have a vision for your life on a daily basis is what is going to help you grow and live that life you want to live. Now it’s important to note there are a ton of different ways to do this and hundreds of people smarter than me you can probably look to teach you as well. I’m just going to explain to you what has worked for me. I break down my goals into 2 different lists. First is what I call my on-going dreams list. This is a list of things I want to accomplish in my life. Long-term goals that I feel I absolutely have to do during my lifetime. I can add to this list at any time but it is important that I am 100% positive I want to strive to achieve this goal in order for it to make it to this list. Sit down and think about the things you truly want to accomplish in your life, think big, and think long term. But don’t put anything on the list that is a maybe. If you “think” you want to do this, keep it in mind and wait to write it down until you are absolutely certain. Fitness: where do I want to be 30 days from now with my weight, conditioning, max reps, health etc. 4 weeks. Faith: any and all goals inside of your relationship with the man upstairs. Others: who do I want to spend time with, who do I want to go see, do I want to give back, volunteer? Career: any and all goals inside of your everyday job or career. Experiences: where do I want to visit, what events do I want to go to, what do you want to experience? Other Personal Development: these are ways I want to improve, investments I want to make, different income lines, hobby goals, or areas outside of the 5 categories listed above. The easiest example I can give here is fitness. If your overall goal is to get down to 200 lbs and run a 6 min mile but you’re currently at 250 and a 10 min mile. Maybe your goal in 30 days is to be down to 243 lbs and run a mile in 8 minutes 30 sec. You can then break that down further into how you are going to achieve that: how many times you are going to the gym each week, what food you are going to eat, things you might be giving up for 30 days, etc. 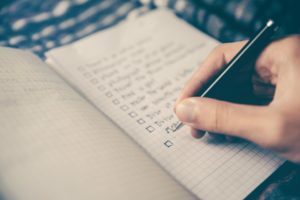 This is basic stuff but ultimately you want to create a vision for your future with your on-going dreams list and a short-term solution to be moving toward those goals with your 30-day list. This just keeps you focused and helps drive purpose for every day you open your eyes in the morning. Too many times I’ve woken up with no plan and felt lost in what I wanted to do for the day. This is a daily cure for that issue. Can you take a day off, hell yeah! But at a least you know exactly what your plan is when you wake up tomorrow.